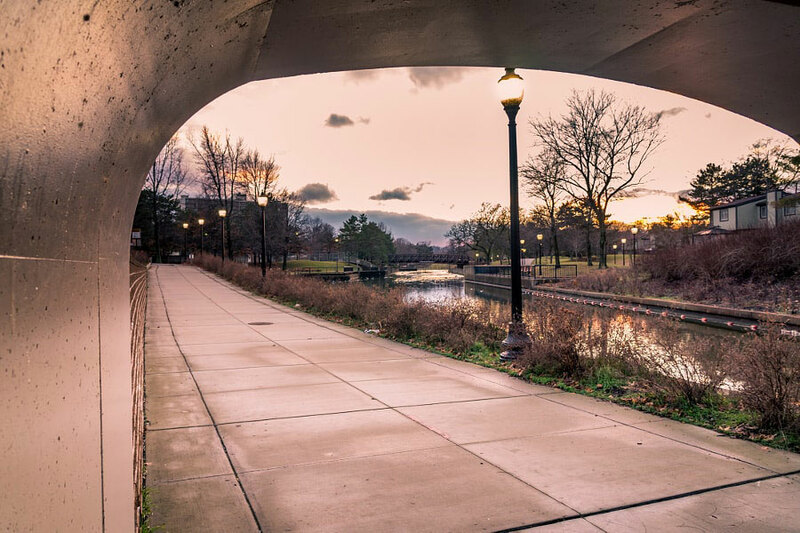 Bartges Bridge by Nathan Haby Known as the City of Invention, Akron, Ohio lies at the center of “Polymer Valley” and presents opportunities for those who seek blend between business and community. From the 19th century and forward, Akron has been focused on innovation. First called “Summit City” then “Rubber Capital of the World”, this dynamic city created a hard-working society and an environment for success and growth. Companies like Goodrich Corporation, Goodyear Tire and Rubber Company, Firestone Tire and Rubber Company and General Tire were all headquartered here in the 20th century during the emerging automobile era. With the constant pull towards economic prosperity, Akron transitions from tire manufacturer to the new age of biomaterial companies. Home to Goodyear Polymer Center and National Polymer Innovation Center, University of Akron offers a great learning experience for students entering this market. With Akron as an up and coming leader in biomaterials, this industry has much to gain from its alliance with the university, in which furthers students skills and knowledge of the field upon graduation. This in return affects the economic growth in the city when these individuals leave school and become active members in the Akron workforce. As a hub of innovation, Akron houses more than polymer-related companies. While these companies do attribute to some of Akron’s success, other industries have emerged. Along with influence of higher education, the biomedical industry provides 600 biomedical businesses and 230,000 healthcare and bioscience workers. Akron General and Akron Children’s are among the top major employers in the city and helps the region rank 5th in the world for neurotech healthcare, according to Akron Biomedical Corridor. Not only is Akron a place of business, but also a city of culture and entertainment. The Akron Civic Theatre and Akron Art Museum offer fun and simple events and shows throughout the year as well as Akron Symphony Orchestra. Every year, many festivals are held here from the Rib, White & Blue Food Festival to the National Hamburger Festival. Each of these events give Akron a unique “taste” and supports the involvement within the community. With companies like Launch League and Akron Global Business Accelerator, startups in Akron have the will to succeed and thrive in this innovative city. Launch League helps startups, i.e. Design Flux Technologies, with finance and connection to the community. With more startups rising in the area, the Akron Global Business Accelerator creates the opportunity for founders to create their own startups as it houses one of the country’s top performing technology business incubators. As the cost of living is much lower than the metro cities on the coasts, 9.9% below national average according to Forbes, this inventive city offers a great place for business and living. With Halloo, you can manage your company from Akron or anywhere and stay on track with your team. Find an Akron area phone number for your business. To search numbers available in area code 234 or 330 click here. This entry was posted in Local phone numbers and tagged Akron Phone Numbers by Kathryn Anderson. Bookmark the permalink.